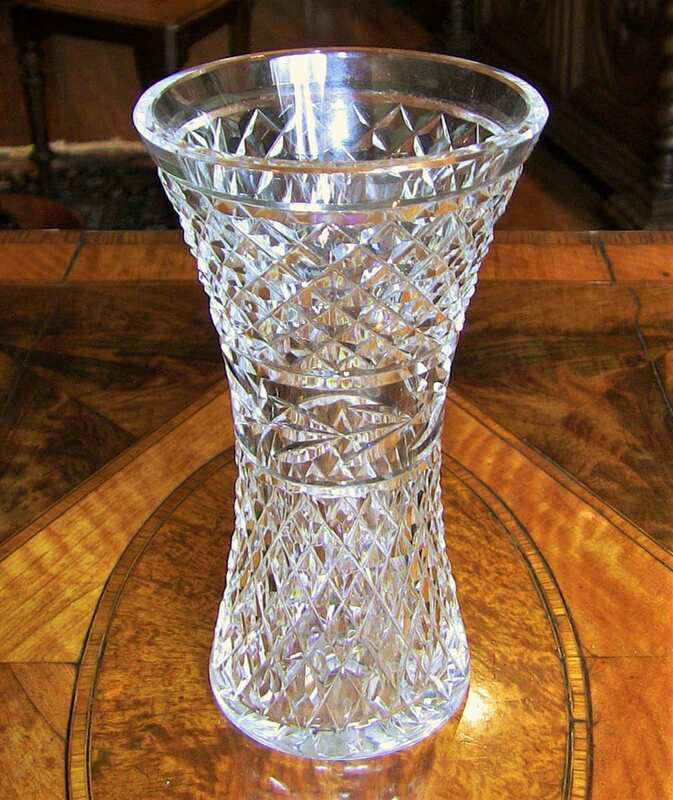 Irish Waterford Crystal Glandore 8 inch Vase. Nice Medium size……8 inch……. 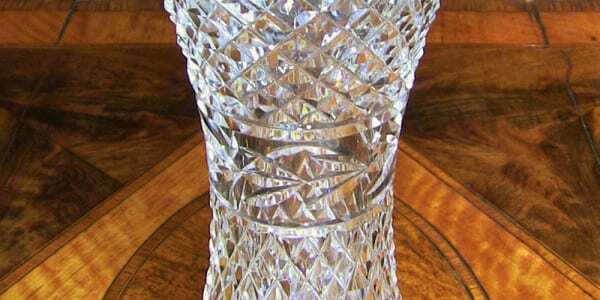 Waterford Crystal Vase in Glandore pattern. IN PERFECT ..... MINT CONDITION !! ALL OF OUR IRISH CRYSTAL IS 100% IRISH MADE !! WATERFORD: Waterford Crystal is a manufacturer of crystal. It is named after the city of Waterford, Ireland. Waterford Crystal is owned by WWRD Group Holdings Ltd., a luxury goods group which also owns and operates the Wedgwood and Royal Doulton brands. WWRD was acquired 2 July 2015 by the Fiskars Corporation. In January 2009 its Waterford base was closed down due to the bankruptcy of the Wedgwood Group. After several difficulties and takeovers, it re-emerged later that year. In June 2010, Waterford Crystal relocated almost back to its original roots, on The Mall in Waterford City. This new location is now home to a manufacturing facility that melts over 750 tons of crystal a year. This new facility offers visitors the opportunity to take guided tours of the factory and also offers a retail store, showcasing the world's largest collection of Waterford Crystal. The origins of the crystal production in Waterford dates back to 1783 when George and William Penrose started their business. It produced extremely fine flint glass that became world-renowned. However, their company closed in 1851. In 1947, Czech immigrant Charles Bacik, grandfather of Irish senator Ivana Bacik, established a glass works in the city. Skilled crystal workers were not available in Ireland so continental Europeans were used. Aided by fellow countryman and designer Miroslav Havel, the company started operations in a depressed Ireland. By the early 1950s it had been taken over as a subsidiary of the Irish Glass Bottle company, owned by Joseph McGrath, Richard Duggan and Spencer Freeman of the Irish Hospitals' Sweepstake, heavy investors in Irish business at that time. In 1970 John Aynsley and Sons was taken over by Waterford and renamed Aynsley China Ltd.
Jasper Conran began designing his signature range of crystal for Waterford in 1999. The endeavour has evolved into four unique lines for Waterford and a complementary tableware collection in fine bone china for Wedgwood in 2001. The Chinese fashion designer John Rocha started designing a range of cut crystal stemware and vases in collaboration with glass designer Marcus Notley in 2001. Due to rising competition Waterford Wedgwood announced the closure of its factory in Dungarvan in May 2005, in order to consolidate all operations into the main factory in Kilbarry, Waterford City, where 1,000 people were employed by the company. The move resulted in nearly 500 Dungarvan workers losing their jobs. Waterford Crystal Limited was, until March 2009, a subsidiary of Waterford Wedgwood plc, itself formed through the acquisition by the then Waterford Glass Group of the famous pottery manufacturer Josiah Wedgwood in 1986. The last chairman was Tony O'Reilly, and the CEO John Foley. The leading shareholders of the holding company were former billionaire O'Reilly and his family, joined in the last decade by O'Reilly's brother-in-law, Greek shipping heir Peter Goulandris. Waterford Wedgwood was forced into receivership in early 2009. On 5 January 2009, news of the receivership of Waterford Wedgwood Ltd. was announced in Ireland and the UK. On 30 January 2009 it was announced that the Waterford Crystal plant in Kilbarry was to shut down immediately, despite earlier promises to discuss any such move with the unions in advance. The Kilbarry operation featured a tourist centre offering guided tours of the factory, a gift shop, café, and gallery. Many of the employees performed an unofficial sit-in The sit-in made the BBC News, hoping to prevail upon receiver Deloitte to retain those jobs. On 4 February 2009, there were protests across the city at how the workers were being treated. On 27 February 2009, the receiver, David Carson of Deloitte, confirmed US equity firm KPS Capital were to purchase certain overseas assets and businesses of the Waterford Wedgwood Group. The sit in ended in March, 2009 after workers agreed to split a payment of €10m. The fight by the workers to keep the factory open is chronicled in a PBS online documentary. Under the receivership managed by Deloitte, ownership of most of Waterford Wedgwood plc's assets was transferred to KPS Capital Partners in March 2009. Waterford Crystal, along with Wedgwood, Royal Doulton, and other brands, were transferred to the new company WWRD Holdings Ltd. The sale did not include the factory or visitor centre in Kilbary, Ireland. The visitor centre shut its doors on 22 January 2010. A new visitor and manufacturing facility opened in June 2010. On 11 May 2015 in a deal expected to close July 2015, the Fiskars Corporation, a Finnish maker of home products, agreed to buy 100% of the holdings of WWRD. On 2 July 2015 the acquisition of WWRD by Fiskars Corporation was completed including brands Waterford, Wedgwood, Royal Doulton, Royal Albert and Rogaška. The acquisition was approved by the US antitrust authorities.